Why study at the English Language School? Why our education is good for you? What does Geo Milev ELS give you? Geo Milev English Language School Rousse is a state high school with a 5-year education course, including a wide range of educational programs with special emphasis on intensive training in foreign languages. The school specializes in foreign languages. The major subjects are English, Bulgarian Language and Literature, French, German and Russian. The tendencies in the development of today’s society call not only for a good command of foreign languages, but also for the presence of wide knowledge of humanitarian culture, erudition, global thinking and orientation towards the European system of values. Geo Milev English Language School is part of The UNESCO Associated Schools Project. It takes part in the implementation of many national and international projects aiming at satisfying the needs of students and teachers alike. The school has also built a good partnership with various non-governmental organizations. Geo Milev was born in a teachers’ family. Since childhood he had shown interest in literature and painting. In 1907 in the children’s newspaper “Slaveiche” (issue 15, 5.01.1907), his first poem was published. As a student in the high school of Stara Zagora (1907 - 1911) he published hand-written newspapers. He compiled collections which he illustrated himself. He also wrote humorous, patriotic and intimate poems; signing them as Geo Milev, Geo Kasabov, Georgi Milich, Geo Milich. 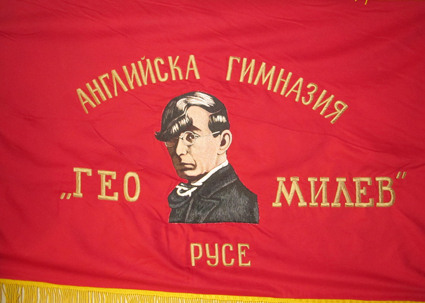 His school poems were influenced by the works of Slaveikov whom Geo Milev considered as his mentor in poetry and aesthesics. During his school years he translated poems by Pushkin, Lermontov, Nekrasov, Kolcov, Fet, etc. 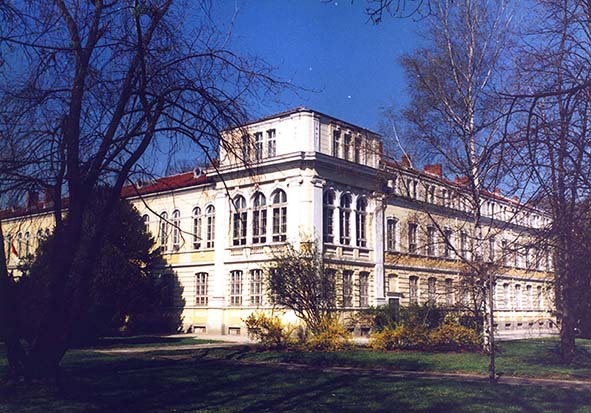 He read Roman philology in the University of Sofia (1911 - 1912); he continued his education in Leipzig (1912 - 1914) where he attended philosophy and theatrical art lectures and wrote a dissertation on Dehmel. In December 1913 (in “Listopad” magazine) his first publications, entitled “Literary-artistic Letters from Germany” appeared. At that time Geo Milev was a passionate supporter of individualism and aesthetics. He got to know German literature and was greatly influenced by modern German poetry. In June 1914 after the beginning of World War I he left for London where he studied English literature and English. He met the emigrant Belgian poet Werharn. Having gone back to Germany to continue his education Geo Milev was suspected of being a British spy and was arrested by the police in Hamburg. Due to lack of evidence he was later released. He arrived in Leipzig but the circumstances soon forced him to return to Bulgaria (1915). Geo Milev published a limited edition of literary brochures about Malarme, Dehmel, Werlen, Werharn, Nietzsche which contained poems translated by Milev. Each brochure was dedicated to one of the young symbolists – Liliev, Debelyanov, Trayanov and Rainov. 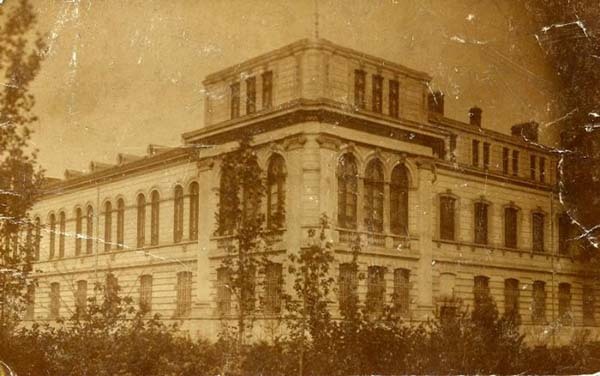 “Geo Milev” English Language School was found in 1963 as a secondary state school with a 5-year educational course specialized at mastering foreign languages. The school may be considered a follower of the tradition of intensive language studies in our town that was set more than 100 years ago by the French College “Notre Dame de Sion”. Since its creation in 1963, the school has taken one of the top spots in the spiritual life of our town. “Geo Milev” English Language School is municipal secondary school with a 5-year educational course that includes a wide spectrum of general subjects with special emphasis on the intensive foreign language training. The specialized subjects are Bulgarian language and literature and the English, French, German and Russian languages. The school has a long tradition. 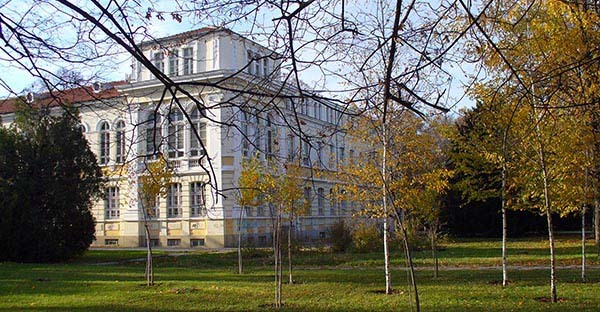 It is one of the first schools in Bulgaria that was associated with UNESCO in 1976. During these more than 50 years of existence, the school has played a significant role in the lives, both personal and professional, of many young people. A great part of the teachers in the school are its former graduates. The students receive varied general knowledge in the field of the humanities and natural and mathematical science and their subjects. The projects on preserving the environment, defending the human rights and the peace, the global problems and the international understanding have been approved by the Secretariat of UNESCO. Under its recommendation, the good achievements of the school have been spread to other UNESCO-associated schools and clubs not only in Bulgaria, but in other countries as well. The virtues of the school are measured by the success of its alumni. Around 99% of the graduating students continue their education in universities and colleges with a variety of majors: international economic relations, economics, law, medicine, engineering, architecture, philology, pedagogy and others. A great number of the school graduates specialize and work abroad. The School specializes in foreign languages. Major subjects are: English, Bulgarian, German, French and Russian . “Geo Milev” English Language School offers a five-year course of study in English, which helps the students reach the highest standards of the English and American certificate exam format. The coursebooks are authentic and up-to-date, so that they can motivate and facilitate the students in developing the language competence in enabling them to compete with others and to succeed in passing the Bulgarian admission tests, TOEFL, SAT and CAMBRIDGE. Apart from the tuition in English, a team of highly accomplished teachers help the students get in touch with British and American culture and develop their cultural competence. The two-year course of study in English and American Literature (in 11th and 12th grade) introduces the achievements of British and American classic literature and stimulates spiritual enrichment; the traditional play in English, that is staged annually , teaches them empathy. The all-round preparation of the students at “Geo Milev” English Language School guarantees their successful fulfilment at prestigious universities in Bulgaria as well as In USA and Europe, amongst which Harvard. For the new generation of Bulgarians speaking two or more languages fluently has been gradually turning into a great necessity . The processes of sociopolitic and economic integration of the countries in the world have turned the speaking of foreign languages into an utmost importance to young Bulgarians. The foreign language gives a the opportunity of studying and finding work in other countries as well as participating actively in projects. Studying German as a second language In “Geo Milev” English Language School Is based on the most innovative approaches and detailed content. The school plan that is utilized is the German “Deutch ist in”( “Letera” publishing house) . The tuition in German as a second language is linked with the first foreign language and the mother tongue and culture. The communicative skills, along with the strategies derived from the other languages, function as a basis during the whole process of studying. The achievements and fulfilment of young people today are dependent on mastering at least two foreign languages. 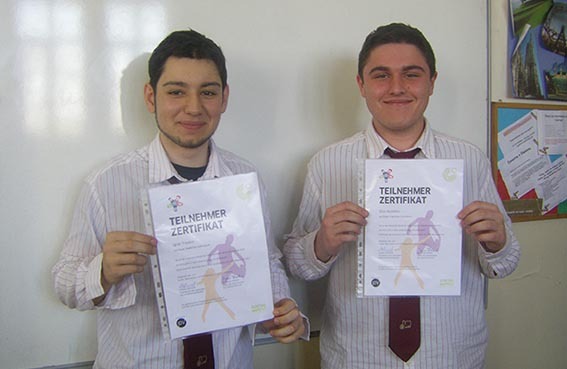 The aim in teaching German is not only to build up communicative skills, but also to help students get the new certificate “Zertifikat Deutch”, valid in Germany, Austria and Switzerland. This enables our students to compete on the Bulgarian and international job market. French classes existed in the school between 1982 and 2005. French as a second foreign language is opted for by those students, who want to leave our school with the knowledge and skills, allowing them to use it fluently. French literature and French cultural studies are also included in the curriculum. Students have the opportunity to get in touch with authentic French speech thanks to our French lecturers who help them develop their communicative skills through a friendly talk. Famous characters from French classics come to life thanks to our students who bring every year a French play on stage. Captivated forever by French culture, some students continue their studies in France. The increased interest in Russian language meets the recent requirements to know more European languages. Studying Russian as a second, and especially as a third foreign language, gives school-leavers better job opportunities. 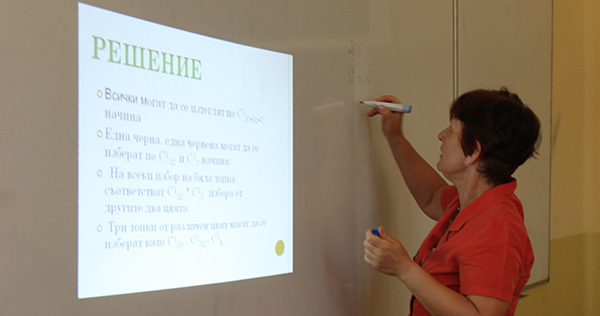 In Russian classes students do not only acquire communicative skills but also enrich their knowledge about Russia through various sources of information. One of the main approaches is the group and project work through which students demonstrate their skills and get sense of fulfillment and a stimulus for further improvement. Because you will have the opportunity to develop your abilities to think critically and your skills to work individually, to formulate ideas orally or in a written way, to use your imagination by a direct participation in creative processes. You have the opportunity to study different scientific subjects in English and to understand the relations between science, technology and quality of human life. Our main mission is clear – to help young people find their identity, discover and use their own unique abilities. We hope that in the process of studying our students will become more tolerant to the social differences and to the rest of their classmates, will be able to make difference between a fact and opinion and to synthesize as well as analyze. We believe that our students will receive broad general culture, will master written and spoken English and will use it fluently. We are sure that they will be able to use their skills and abilities, will be ready to answer in the right way to the changes of the world, will be useful to the society and will be happy and satisfied with themselves. Professional fulfillment of the students About 99% of our students continue their education at High Schools in different fields: international economic relations, economics, law, medicine, engineering, architecture, philology etc. 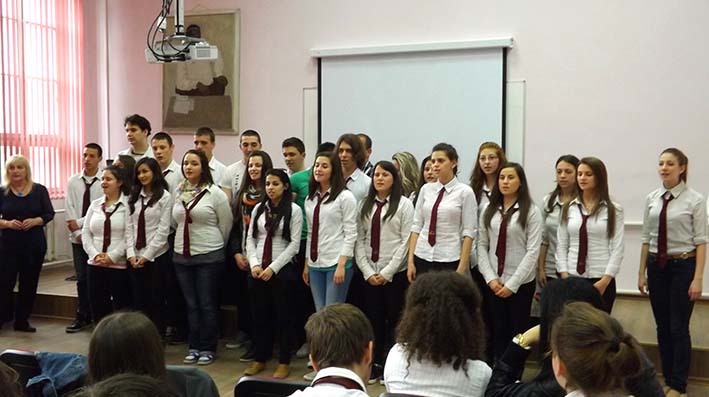 A great part of the alumni of the school continue their education in Bulgaria and abroad. The education of the students at the English Language School ‘Geo Milev’ offers them a good opportunity to study at colleges and universities all over the world. There are good relations with Cultural Centres of the UK, the USA, France, Germany, Austria and Spain. Almost all students that graduate from the school continue their education at universities in Bulgaria, the UK, Germany, the Netherlands, Denmark, France and the USA. They study different subjects which is in itself a proof of the exceptional level and quality of the offered education. The school offers a study of English in great detail. Thanks to it the students gain excellent results in the tests TOEFL, SATI, SATII. The alumni of the school continue their education in prestigious universities in the USA and Europe – Harvard, Princeton etc. During its 48-year existence the school has played a crucial role in the personal and professional life of many young people. A great part of the teachers are former alumni of the school. After the successful launch of the first project - KA1 “Educational Mobility”, our school has been approved as a coordinator of another project – KA2 “Strategic Partnerships” among European schools. It’s a huge success as we are among the eight schools in the country. The project has been highly assessed as a concept, strategy and impact of the outcomes on the participants and the community as added value in education. The project is entitled Young Europeans Propose Solutions- YEPS. The first transnational meeting will be held from 2nd- 6th December in Ruse. Our school will be the host to partners from Germany, Lithuania, Turkey and Finland. Both teachers and students will be working on youth problems seeking possible solutions to them. The aim of this two-year project is to give young people the confidence to tackle their problems more efficiently. Through identifying similarities and differences young Europeans face today, students are expected to build up more active citizenship. Work in an international team will enhance their intercultural competence as well as equip them with a lot of strategies and skills necessary to understand the world they live in and their place in it. The Importance of Being Earnest was presented in English on 26.06. 2014 in the House of Culture. After the great success of scenes from My Fair Lady, staged for the school jubilee concert in 2013, the performance of The Importance of Being Earnest took the audience by storm. The staging of the play came as a result of the efforts of the school drama club led by the English teachers Iliana Hristova and Daniela Popova. 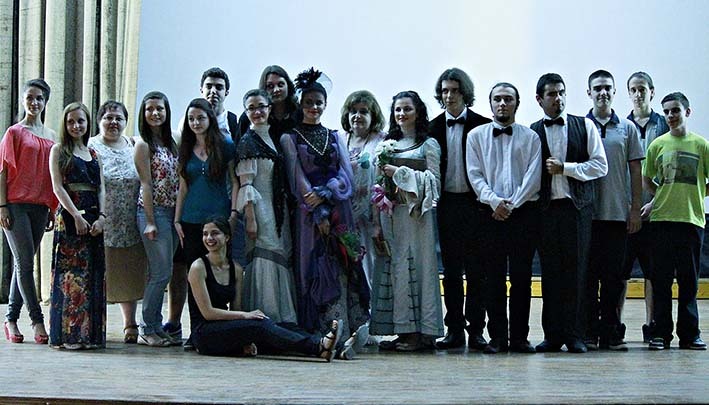 The participants were students from the 11th grade: Teodor Kalamov as Jack, the play’s protagonist, an eligible bachelor, Ivelina Petkova as the sophisticated, pretentious Gwendolin, Ralitza Gospodinova as the romantically naïve Secily, obsessed with the name Earnest , Antonia Genova as the snobbish, domineering Lady Bracknell, Anna Petkova as the pedantic, righteous Miss Prism, Petur Stoikov as Dr Casuble, whose heart beats for Mr Prism beneath the religious exterior, Borislav Baev and Stanislav Nikolov as the butler and and the manservant, solemnly watching their masters’ follies, and last but not least Krustyo Kyosev from the 10th grade, a wonderful Professsor Higgins last year, and an incredibly convincing, charming Algernon now. The actors were brilliant, putting so much effort, commitment, competence and talent in the play that they kept the audience amused throughout the performance and overwhelmed by the end. The project was a large-scale initiative as it included many students from the 11th grade who contributed in all fields related to the theatre. They did research and gave presentations on Oscar Wilde’s aesthetic views, other plays and biography. Many were involved in the process of the play’s production by working on the costumes, setting, props, music, posters, leaflets and make-up. The success of the performance will inspire the team to keep the school tradition alive and present a new play next year.